Hi, everyone! Today’s lesson is my Twitter follower, David and Facebook friend, mew. They both asked me to make a lesson on how and when to use はず(= hazu). I was going to make a mini lesson on Facebook, but it got longer than I expected so here it is. You might think the usage of はず ( = hazu) is easy, 易しいはず！= Yasashii hazu = It should be easy! Still the difference of two past tense forms and negative forms might confuse you. Hopefully this lesson will clear things up. to be supposed to be/do, / I expect ~ / things should work as you have expected. = Kono omocha wa denchi wo iretara ugoku hazu desu. = This toy is supposed to move when you put in batteries. = Maggie wa ima ie ni iru hazu da. = Maggie should be home now. = Koredake benkyou sureba daredemo shiken ni ukaru hazu da. = Anybody would pass the exam if they studied this much. = Ashita nimotsu ga todoku hazuda. = The package is supposed to be delivered tomorrow. / I expect the package will be delivered tomorrow. = Kanojo mo kaigi ni shusseki suru hazu desu. = She, too, is supposed to attend the meeting./ I expect she will also attend the meeting tomorrow. = Mousugu takushii ga kuru hazu desu. = The taxi should come soon. / I expect the taxi will be here soon. = Ano omise wa sokosoko moukatte iru hazu da. = That place (store, restaurant, bar) must be making some (modest) money. = Kono saito ni mainichi kitara ichinengo ni wa nihongo ga kanari joutatsu shiteiru hazu desu. = If you come to this site everyday, your Japanese should improve a lot. Go check the function of のに in this lesson. = Shinbun wa maiasa rokuji ni haitatsu sareru hazu nanoni kyou wa mada kite inai. = They are supposed to deliver the newspapers by 6:00 every morning but they haven’t delivered it yet today. Variation : なんだけど ( = nandakedo), なのだが ( = nanodaga), なのですが ( = nanodesu ga), etc. = Maggie wa ima ie ni inai hazu da. = Maggie shouldn’t be home now./ Maggie is not supposed to be home now. = Ano geimu wa america dewa utte inai hazu da. = The game is not supposed to be sold in the U.S.
= Kanojo wa mada hatachi (or nijussai) ni wa natte inai hazu da. = I don’t think she can be 20 years old yet. / She can’t be 2o years old yet. = Konna muzukashii mondai wa kare ni wa tokenai hazu da. = He should not be able to solve such a difficult problem. = Kanojo ga anna otoko wo suki ni naru hazu ga nai. = There is no way that she would like that kind of man. = Risou no kare nante iru hazu ga nai. = There is no such thing as an ideal boyfriend. = Sonna yarikata de umaku iku hazu ga arimasen. = It would never work like that. / Things shouldn’t work that way. = Maggie ga sono koto wo shiranai hazu ga nai. = There is no way that Maggie doesn’t know that. = Maggie wa mochiron sono koto wo shitte iru hazu da. = It is obvious that Maggie knows that. When you are sure something had happened in past / you or someone did something. /I expect something happened/ I expect someone did something. = Kinou kare wa koko ni kita hazu da. = He must have come here yesterday. = Mou minna neta hazu nanoni ikkai de monooto ga suru. = Everybody should have gone to bed already, but I hear something downstairs. = Isogashii karatte denwa gurai kakeru koto ga dekita hazu desho! = Even though you were busy, you could have at least called me. = Benkyou shinai to shiken niwa ukaranai to wakatte ita hazu da. = You should have known you would fail you didn’t study. = Koko ni saifu wo oite oita hazu nanoni nai. = I thought I have put my wallet, here but it is gone. = Shinda hazu no kare ni atta toiu hito ga iru. = There are people who said they had seen him — and he’s supposed to be dead. / There are people who have seen (the supposedly dead) him. = Kono hanashi wa Maggie wa shiranakatta hazu da. = I am sure Maggie didn’t know about this. It is used when the things didn’t turn out to be what you had expected. You can tell the speaker is expressing the feelings of regret, unsatisfied feelings, etc. = Kare towa kinou au hazu datta. = I was supposed to see him yesterday. = Everything should have gone well. = Kono mama ikeba ooganemochi ni naru hazu datta noni..
= Konna tokoro ni kuru hazu dewa nakatta. = I was not going to come this kind of place. / I wasn’t going to come to a place like this. = Konna tokoro ni kuru hazu ja(a) nakatta. Note : In case you get confused… Here is the difference. = Maggie is supposed to arrive at 3 o’clock. = Maggie wa sanji ni tsuita hazu da. = Maggie wa sanji ni tsuku hazu datta. It must be Maggie Sensei who ate my snack. = Watashi no oyatsu wo tabeta no wa Maggie sensei ni chigainai. = Watashi no oyatsu wo tabeta no wa Maggie sensei no hazu da. はず ( = hazu) is based on more logical assumption or reliable information. = Kanojo no tsukutta mono nara nandemo oishii hazuda. = Everything she makes must be delicious./ I expect everything she makes is delicious. = Ano doresu wa kouka na hazu da. = That dress must be expensive. = Maggie no imouto nara kawaii hazu desu. = Ashita no shiken wa kantanna hazu da. = (I expect ) The exam tomorrow should be (or is supposed to be) easy. = Maggie Sensei wa shigoto chuu wa motto majime na hazu da. = I expect Maggie Sensei is more serious when she works. / Maggie Sensei should be more serious when she works. = Benrina hazu no sumaho ga tokidoki sugoku fuben ni kanjiru. = Smartphone is supposed to be convenient, but I sometime feel it is very inconvenient to use. There are two negative forms. = Maggie no ryouri ga oishii hazu ga nai. = There is no way that Maggie’s cooking is delicious. / Maggie’s cooking can’t be delicious. / I expect Maggie’s cooking can’t be good. = Maggie no ryouri wa oishiku nai hazu da. = Maggie’s cooking is supposed to be bad. (not delicious) / I am sure that Maggie’s cooking is bad. = Watashi no ryouri ga oishiku nai hazu wa nai. = There is no way that my cooking is not good. = Watashi no ryouri wa oishii hazu da. = My cooking should be good! = Watashi no ryouri ga mazui hazu wa nai. = My cooking can’t be bad. = Ima demo konnani kawaiino dakara chiisai koro Maggie wa motto kawaikatta hazu da. = Since Maggie is this cute now, she must have been much cuter when she was little. = Kanojo no uedingu doresu sugata wa suteki datta hazu da. = She must have been beautiful in a wedding dress. = Kinou wa heijitsu datta kara shizuka datta hazuda. = Since it was a weekday yesterday, it must have been very quiet. = Jibun ni totte tokubetu na hazu datta hito ga kirai ni natte kita. = I’ve come to dislike someone who was supposed to be special for me. = Shiken wa ashita no hazu da. = The exam should be tomorrow. = Kare ga sagashite ita no wa kono hon no hazu da. = The book he was looking for should be this one. = Gonen mae kare wa mada shougakusei datta hazuda. = He must have been an elementary student five yeas ago. = Anohito no ie wa kono hen datta hazuda. = I think his (her) house was around here. = Anokoro no yachin wa nanaman-en datta hazu desu. = I think the rent at that time must have been 70,000 yen. You use this form when things didn’t work out as you planned and you wonder why or express your complains, regrets or unsatisfactory feelings. = Kondo kau no wa neko no hazu datta ga inu wo kau koto ni natta. = We were supposed to have a cat as a pet this time but we ended up having a dog. = Ashita wa kyuujitu no hazu deshita ga shigoto wo shinakute wa ikenaku narimashita. = It was supposed to be my day off tomorrow, but I’ll have to work after all. = Kare to wa tomodachi no hazu datta noni dandan suki ni natte kita. = We were supposed to be (just) friends, but I’ve begun to like him. = This isn’t supposed to be happening. = Konsaato wa rokuji ni hajimarun dakke? = The concert will start at 6:00, right? = It should (start at 6:00) but..
= Demo kore de minna “Hazu” no tsukai kataga wakatta hazu dayone. 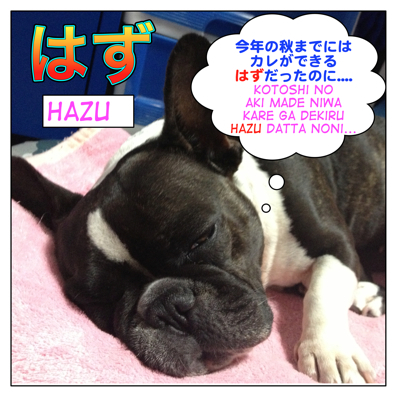 = But I bet you all know how to use “hazu” now. 1. 飲んだはずのミルク”は” → 飲んだはずのミルク”が” is better but the sentence itself sounds a bit mysterious. Is that what you meant? The milk that I thought I drank is still in the fridge. 2. 飲まれた (passive form “The mill that was drunk”) is not natural. 3. I understand. I tried so much to include hazu in a sentence. In this case I tried to combine it with だった but it appears I got it wrong hehe. Thanks Maggie sensei for always helping us. I was supposed to put the wallet here but I didn’t. Oops…it’s difficult. I can not understand! (2) emphasizes the regret or duty that you had to put the wallet but you didn’t. Thanks for adding more explanation. I think I am getting your point. What are we supposed to do if the sentence end with はすなんだ ? はずなんだ is used when you show your strong emotion or frustration because something was supposed to work in certain way but it didn’t work or someone is supposed to do something but they don’t. Can it be excitation, maybe ? It comes from a game I’m playing, and I don’t think frustration would fit the context. Can どかな ( meaning “could be”) be spelled どうかな instead ? I saw it like that in the same game, and from the look of the official translation, I think it should be どかな. It also could be just when you explain things to someone. ごめん、Maggie sensei. I try to make Japanese sentence by myselt. Hope you can understand my Japanese !!!! Actually the usage of でしょう is kind of limited. You use it when you predict something, forecast the weather or it is used in the written form. はず is based on one’s strong belief. 明日は雨が降るでしょう。= It will rain tomorrow. Thank you for taking the time to post all these lessons. They help a lot. For example in this dialogue I’m looking at a couple of bags with a friend. Is it possible to leave out the 鞄 and just say くまモンののはずです or would that sound really weird? Hi again, thank you for your reply the last time. ここに財布を置いたはずなのにない ? please teach me. 置いておく implies leaving something in a certain state. That’s why Maggie used this pattern. It sounds just more natural and adds this nuance. (2) Vておく has a function to leave something the way it is. since はず implies speaker’s guess with conviction it would be unnatural to ask (someone) for it. Thank you for helping Courtney! I have tried to create some sentences using “hazu” but I’m not sure if they are correct… Could you please help me correct this one? = The windows were open. No wonder I couldn’t sleep. It sounds so clear and simple when you explain it! No, I’m telling their confirmation number to my japanese friends who are coming in Rome. And maybe they don’t know what the confirmation number is meant for. So I wanted to tell them what they are supposed to do with it. OK, then you don’t have to be so polite. Prego! Hope you have a great time with your Japanese friends in Rome. I was going to say “sensei”. Pardon me. I’d like to thank you for this great lesson. Sensei, what’s the difference between “hazu” and “tsumori”? Ex: Watashi wa sono hon wo yonda tsumori desu. Watashi wa sono hon wo yonda hazu desu. Chichi wa mada wakai tsumori desu. Chichi wa mada wakai hazu desu. = Watashi wa sono hon wo yonda tsumori desu. = Watashi wa sono hon wo yonda hazu desu. verb past tense + つもり=(~したつもりです。）is used when you thought you did/have done something. = Chichi wa mada wakai tsumori desu. = My father believes he is still young. = Chichi wa mada wakai hazu desu. = I believe my father is still young. Note : As you can see the subject of Ex.3) is “my father” but the subject of Ex.4) is “I”. Thank you very much for your great site, it’s really thorough and great help when studying Japanese. However, there’s a small typo in the following example. I hope you could fix it when you’ve time. Hello! Thank you for spotting the typo. I fixed it. You should have taken off your shoes. 靴を脱がなくてはいけなかったのに= Kutsu wo nuganakutewa ikenakatta noni. But yes, you can use ”はず=hazu” when you blame someone. = I told you that you should have taken off your shoes. Great Lesson! I have two queestions regarding はず. I can always understand the meaning of the sentences that use はず, but when it comes to making up my own’s, I end up getting stuck especially in deciding which verb tenses should be used. So the questions are. Can you use Verb Past tense + はず + だった (i.e, double past tense)? What would it mean? The other question was about a situation that occured to me. I slept at my friend’s house and then he told me he had to wake up at 7 am, but it was already 9 and he hadn’t woke up yet. So I thought of the sentence “He should already have woken up”. And when I tried to translate to japanese, I came up with “もう起きたはずなのに”. Is this correct? Sorry it became a little long, this is the first time I comment on this site but I always follow the posts and it has helped me a lot in my studies! Q1) It is possible to use double past tense. V 1 (past / past perfect)+ はず+ だった = When you expected that you have done something/someone has done something. Q2) That is a tricky one. How about もう起きていなければいけないはずなのに。He should have been woken up already. hi, I like your site a lot, and i have a question! can you do a bit on baking cake and words and sentences you would use in the kitchen and how to understand recipes from recipe books! maybe you could just use some japanese recipe for some cake and then go through it line by line and explain and translate the instruction and mention what other words would be used in the kitchen! Hi Marril! I’m happy to hear you like my site. Right now I have been working on three different lessons and there is a long list of request from people. Still I found cooking will be an interesting topics because I love eating. I can not use someone’s recipe taking out from a book or Internet for copy right reason. But I could make a very basic and general lesson on how to read basic cooking instructions someday. I’m very happy to read your comment. Nov. 17 : I just posted a lesson on FB so please check.